Grace Covenant Academy exists to equip Christian parents to disciple their children to know God and make Him known, through a distinctly Christian education. Grace Covenant Academy is a University-Model School that partners with parents in the mission of educating and discipling students. Located in Frisco, Texas, GCA merges the best attributes of public, private, and home school education to create a distinctly Christian, gospel-centered school that prepares students to be disciples of Christ. Our target is for students to love learning and love God. 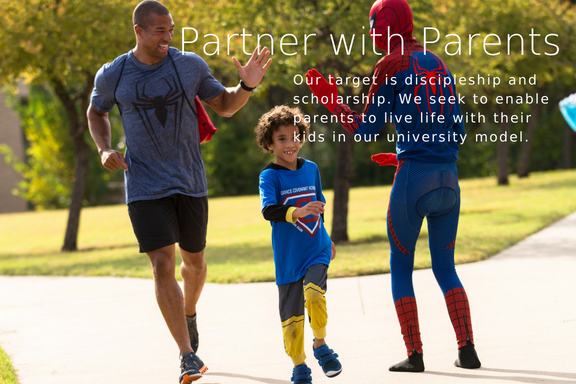 We believe the best education focuses on both scholarship and discipleship! "University-Model" means that students in grades K-5 attend classes at school on Tuesdays and Thursdays. Our Upper School students -- grades 6-12 -- attend classes Monday, Wednesday, and Friday. All students complete lessons on the home days that are carefully crafted by their teachers. They have a full school day at home, but parents don't have to create the lesson plans. The goal is to give parents more time with their children, compared to a five-day school, while providing the structure that helps students make progress. What are the advantages of a University-Model school? Universities tell us that our students perform well in a college setting, because they love to learn, they have learned to manage their time, and have a good work ethic. Our students also perform above average on standardized tests, even though we do not "teach to the test." So, whether you're currently a home-school, private school, or public school family, if you're looking for a place that is serious about educational excellence, parental involvement, and applying the gospel, then we think Grace Covenant Academy might be the place for you. Please take some time to review our website and learn more. Attend an Eagle Preview for prospective families. We host at least one every month. If you click one of the buttons below, you will find the dates and times for the next Eagle Previews. for sponsoring the GCA 5K and Fun Run Oct. 26, 2018.